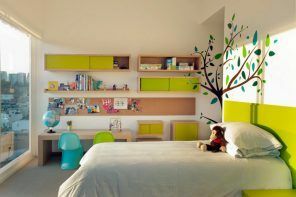 Ikea, a manufacturer of furniture, home and garden products, is popular all over the world with high quality products, affordable prices, a wide range of products and an ecological approach to the manufacture of their products. A comprehensive approach allows Ikea shops, widespread in most countries, offer a wide range of products for any purse size and taste preferences. In this publication, we are considering activities of company in such a popular segment of furniture production, as producing kitchen sets for the most diverse versions of this multi-functional room. The choice of a suite for a kitchen space is just as enjoyable as equally responsible occupation. A large set of functions and a special microclimate for the kitchen put certain criteria on choosing practical and durable furniture. 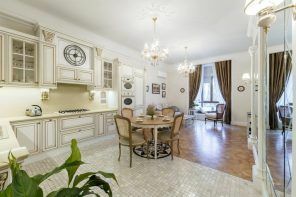 But it is also important to take into account the aesthetic component, because appearance this kitchen space depends predominantly on the style of execution and the color solutions of the facades of the furniture ensemble. 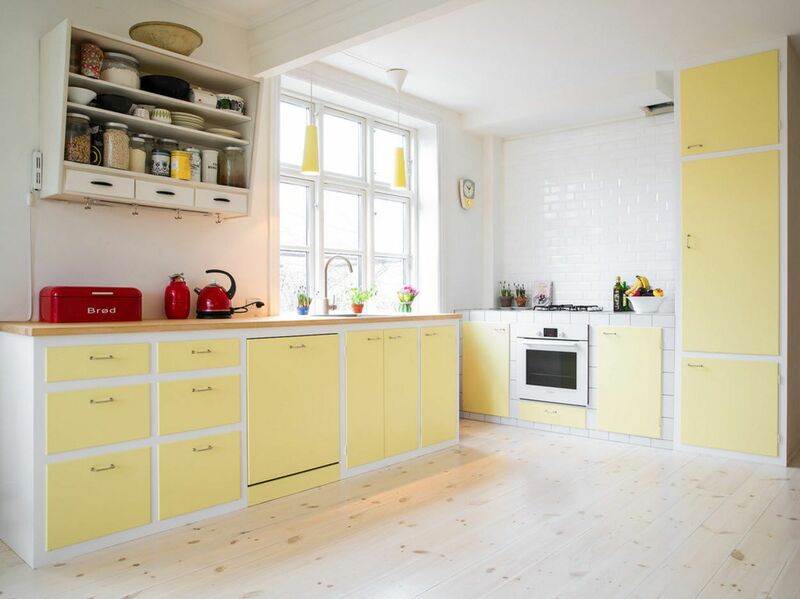 Enjoy our detailed compilation of 100+ photo design ideas of modern, comfortable IKEA kitchens and discover this famous trademark from another side. The main feature of producing kitchen solutions for modern customers can be considered the principle of modularity. 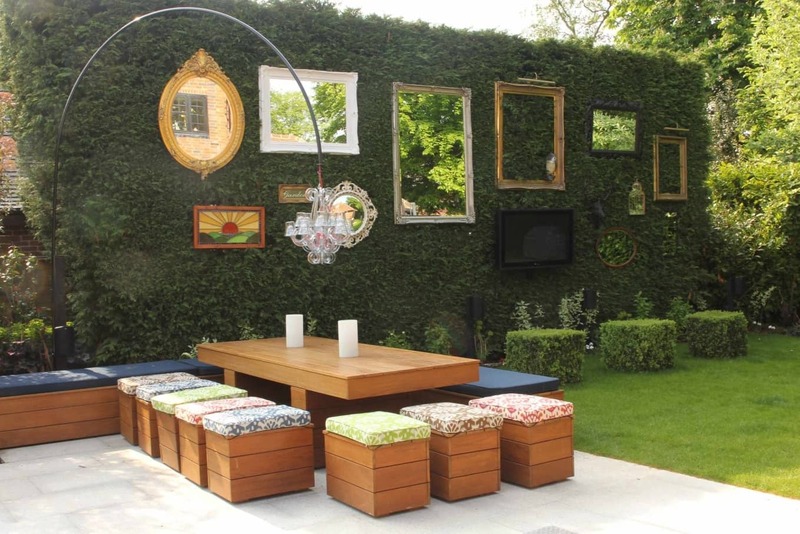 The company offers a wide range of models of furniture modules with various sizes. Picking up the parameters of your kitchen, its geometric features, you can make a kitchen set without resorting to individual production. If your kitchen has non-standard sizes and shape, built-in kitchen appliances have unconventional location, then you can use a special program (free of charge on the company’s website) to calculate the furniture set by your parameters. The company abides the environmental friendliness of the entire technological process of furniture production – from the provision of raw materials to the installation of the smallest hardware. Throughout the process there is a multilevel quality control. Thus, any client can be confident in the safety of the finished product for people and the environment. All products of the furniture sector of the company are made on the principle of interchangeability. For example, in order to refresh the appearance of the kitchen or radically change the image of the room, it will be sufficient to change the facades of kitchen cabinets – their doors. In some cases it is possible to manage even smaller expenses, replacing only furniture accessories of furniture modules. The advantage is that they can combine modules from different collections, make up ensembles with facades of different colors creating completely unique interiors for a quite democratic price. Most models of kitchen facades are presented in a traditional or modern style with a neutral color design, which allows them be easily integrated into almost any design concept. Every buyer can find his own version of style, color and texture. The company constantly expanding its model range, looking for innovative ideas that could help to improve the quality of finished products, the period of their operation and technological characteristics. Ready-made solutions for the kitchen from Ikea are suitable for both spacious rooms and small-sized kitchen spaces of standard apartments. Various ways to save space without losing functionality and storage capacity are constantly being introduced into the company’s new collections. It is one of the most universal variations of the arrangement of the kitchen ensemble. L-shaped layout allows you to place a sufficient number of storage systems with integrated home appliances in rooms of very different shapes and sizes. In this case, as a rule, there is enough free space for the installation of a dining group, island or peninsula, which can be used as a place for meals. In short, the angular layout allows you to create a full working and dining areas, not at the expense of the storage capacity of storage systems or the size of household appliances. In the angular configuration, it is easy to observe the rule of the “working triangle” by placing the hob or oven on one side of the headset, and the sink – at the perpendicular one. The refrigerator can be installed separately or integrated in a row with a sink. L-shaped layout has a few drawbacks. It is difficult to use only in the passage rooms or kitchens with a balcony block or exit to the backyard. The arrangement of a kitchen ensemble in one row is convenient for kitchen spaces of small size or families, which do not need to install a large number of storage systems and integrate several household appliances into a furniture set. Also, planning in a single row can be an effective solution for families who need to install a large dining room in a small kitchen area. The layout of the kitchen set in the form of the letter “U” is suitable in case you need to place a large number of storage systems with integrated home appliances. In this case, the upper tier of kitchen cabinets can be partially or completely replaced by open shelves (it all depends on the size of the room and your personal preferences). In a large kitchen, the shape of which is close to the square, there will be enough free space to install a dining group or kitchen island in the center of the room. If the kitchen space is too extended, or has a small area, then the table segment will have to be moved to the living room or you’ll have to allocate a separate room. In parallel planning kitchen modules are arranged in two rows opposite each other. 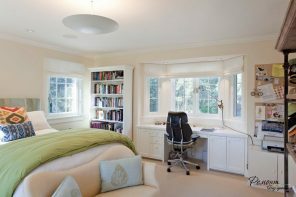 This way of arranging the work area is advisable in walk-through kitchens or those having a large panoramic window, a balcony block or a door (exit to the backyard in a private house). If the room is very elongated, then most likely there will be no free space to install a dining group or kitchen island. If the shape of the room is square or close to it, then a small (preferably round or oval) dining table can be installed without consequences for the ergonomic flow of all working processes. With a parallel arrangement, it is easy to use the rule of the “working triangle”, placing it two “conflicting” imaginary vertices, a sink and a hob, on opposite sides. Ikea mainly uses neutral color solutions for the execution of kitchen facades. Such models can organically fit in almost any design of the kitchen space. 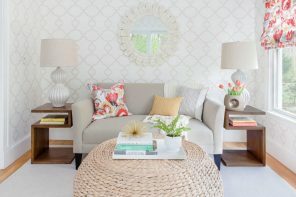 Light, pastel colors are easy to combine with deep dark shades for emphasizing geometry, highlighting particularly significant elements of the interior, creating accents. Neutral color solutions will look organically almost on any finishing background, harmoniously combined with any variant of the countertop design, kitchen backsplash pattern and texture. The white kitchen is the “classic of the genre” for any furniture manufacturer all around the world. White facades are popular at all times, in any performance. Matte modern or traditional, glossy- with fittings or smooth ones – snow-white kitchen set’s doors always create a clean, light and even festive image of the whole room. Among other things, the light kitchen ensemble harmoniously fits into the room of any shape and size, visually creating an expansion of the space volume. Snow-white facades with fittings are one of the most popular versions of the furniture modules from Ikea. 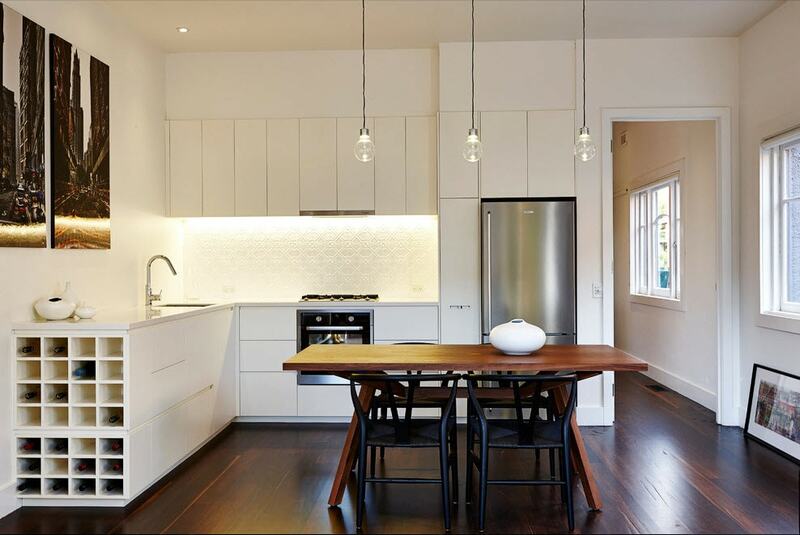 Buyers from all over the world choose this way of creating a bright and clean image of their kitchen premises. 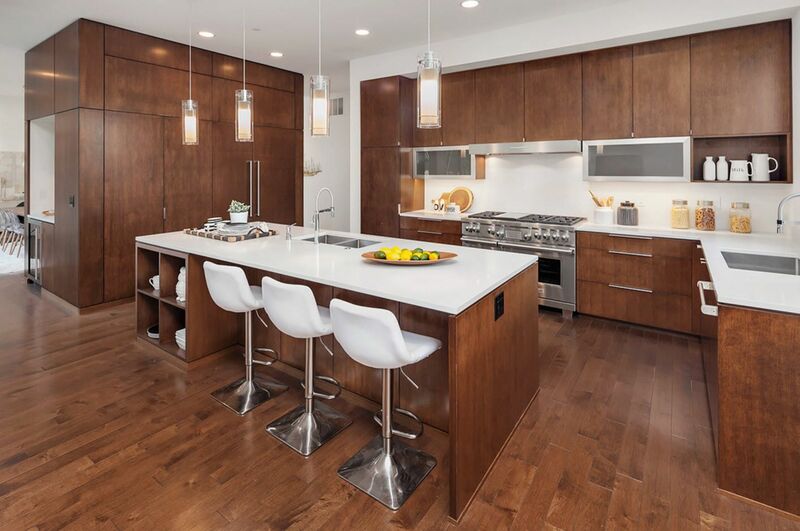 The white facades are shaded by the shine of the stainless steel of home appliances, accentuated by contrasting dark or bright elements of the interior and “warmed” by the integration of wooden surfaces (countertops, decor elements, dining group etc.). The advantage of light facades is not only that they are easy to combine with any color execution of the decoration of the room, but the kitchen set itself can be changed without much expenses. 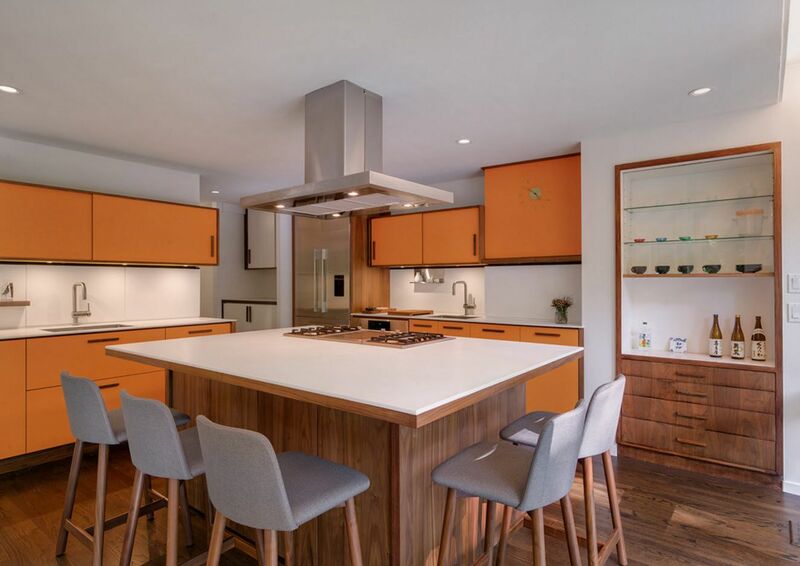 For example, the annoying steel handles on the doors can be replaced with contrast-dark, golden or copper products, transforming the entire kitchen interior. The image will be more harmonious if the kitchen accessories (mixers, hooks and holders for towels) will be made of the same material as the furniture fittings. Beautiful, modern and stylish image of the kitchen can be achieved by using snow-white facades coterminous to wooden (or their spectacular imitations) elements. These may be countertops, facades of the upper or lower tier of kitchen cabinets, decoration of a kitchen island or peninsula, the execution of a bar counter or a dining group. Complex shades of blue are in the trend for not the first season. 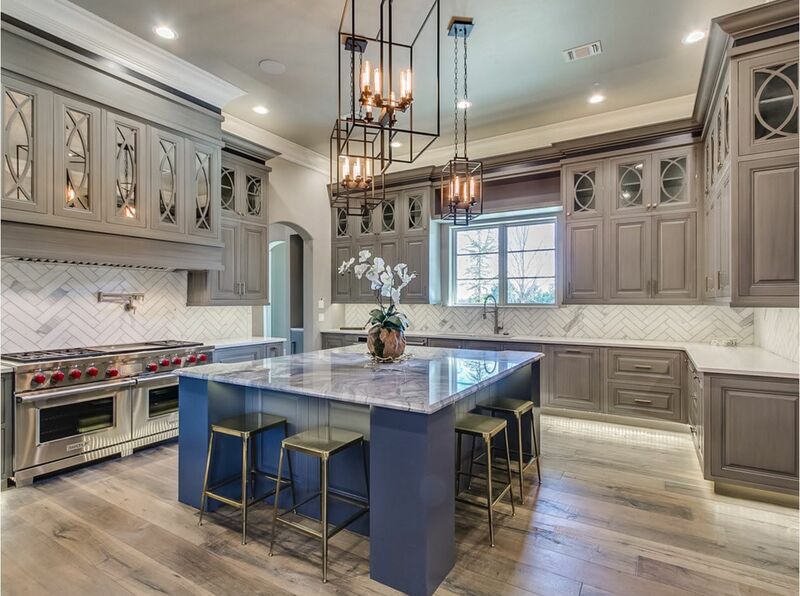 Beautiful, deep shades can be used both as the main color solution for producing of the kitchen ensemble, so as for local integrations of individual elements. If the kitchen premise has mid and a large area, you can choose a beautiful blue color for all kitchen facades. If you need a visual increase of the ceiling height in the room, then the upper tier of cabinets is better to perform in a light tone. 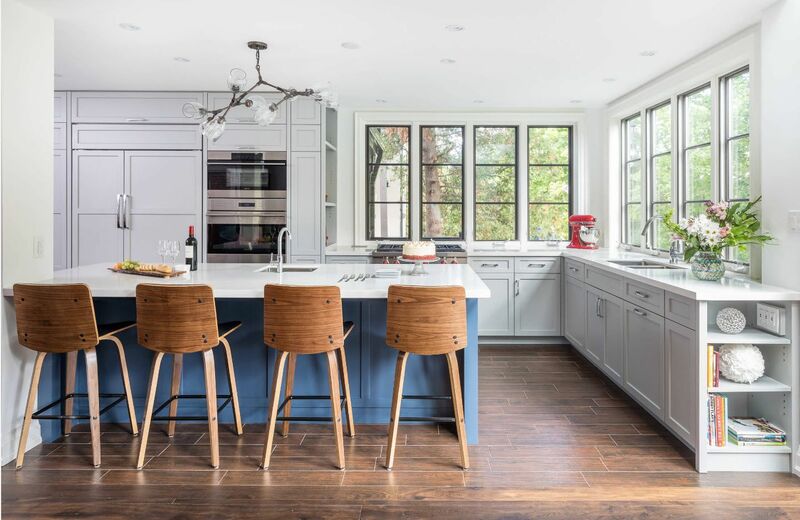 For small kitchen spaces, you can use a deep shade of blue only for the execution of individual elements – the facade of a kitchen island or a dining group. Gray color and a rich palette of its shades are still in fashion. Universal, neutral, noble and unpretentious at first glance, color can harmoniously fit almost any situation in the kitchen space. For small rooms, it is better to stay on light, pastel shades of gray (smoky, color of morning haze), for large kitchens you can use dark, deep colors (anthracite, the color of wet asphalt). Contrasting colors in the performance of kitchen facades are still trendy. You can also use light and dark colors for combining the surfaces of countertops and kitchen cabinets. The obtained result will create an original, dynamic, actual design of the kitchen space in any case. Contrast combinations not only help to emphasize the geometry of the room, highlight objects or areas. 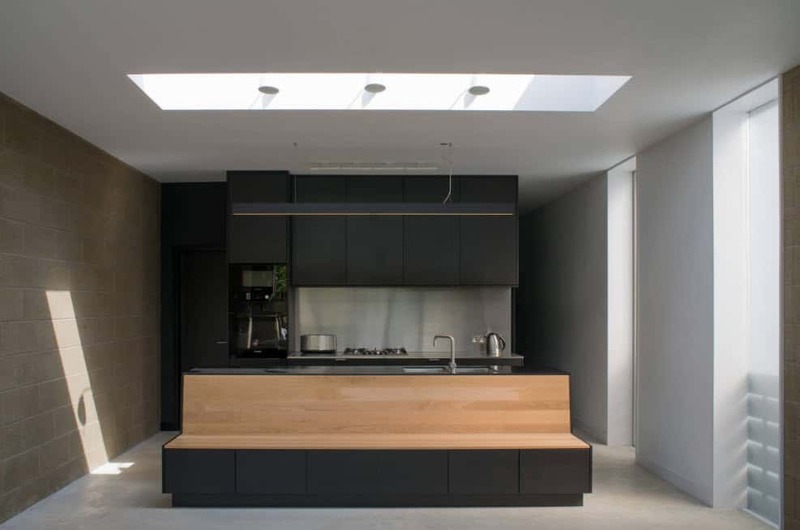 Dark execution of the lower part of the kitchen set together with the light facades of the upper tier, will help visually make the room higher. For truly spacious kitchen facilities, you can use dark colors to perform the entire furniture ensemble. 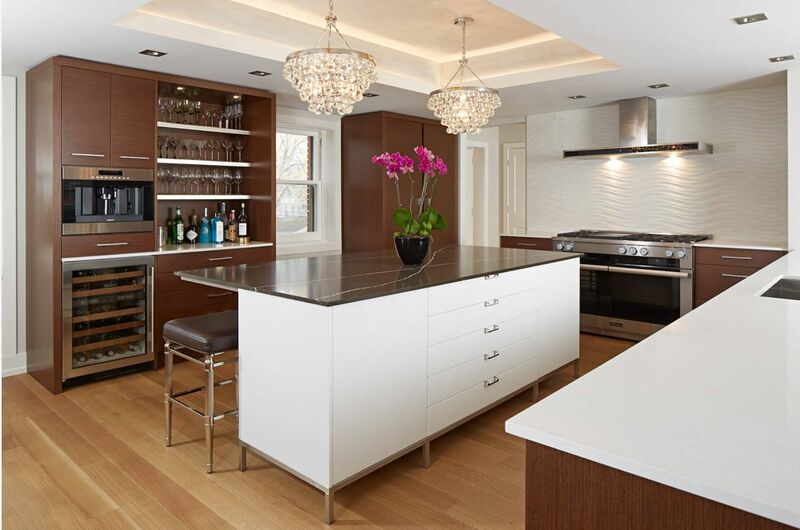 A dramatic, stylish, luxurious image of the kitchen interior will be achieved for sure. But it is important to understand that caring for the dark surfaces of kitchen facades will require more time and effort from you, rather than surfaces in light colors. Modern style of facade execution differs with laconism, minimalism, and practicality. Most often, modern stylistics is reflected in absolutely smooth surfaces in a matte or glossy embodiment. It is possible to combine the variants of execution – the upper level of the kitchen cabinets is made without accessories, and the lower one is equipped with handles on the doors. At the same time, both levels are made in the same texture and color. Minimalist image of kitchen facades perfectly suited for kitchen spaces decorated in one of the variations of modern stylistics. Simplicity and laconicism, functionality and practicality are placed at the forefront. The image of modern kitchen only benefits from this. Decoration is not excluded, it is simply used in other aspects of decorating the kitchen space. Traditional or classical facades today have also undergone some simplification. Carving for wood, monograms and forged furniture gave way to laconic decor, a strict version of the tradition. It is increasingly possible to meet the design option, which is associated with the style of the neo-classic in modern kitchens. It assumes the adapted execution of traditional interiors for the needs of the modern owner who prefers not to hide hi-end household appliances behind the facades. Even if the facades are incredibly attractive – they have glass inserts, a combination of performance materials, moldings and other decorative elements. Doors on rollers or sliding doors interior design ideas are modern innovation, which is primarily intended to save space, and then for decorative purposes….